Have you ever been stuck in a country wanting to be polite, but not even knowing the word for 'please'? Or been frustrated when you couldn't ask for the most basic directions to where you're going? 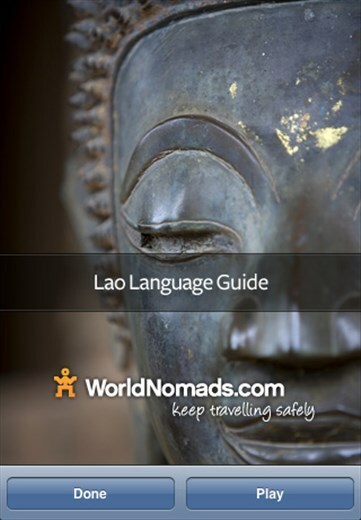 The WorldNomads.com Lao Language Guide gives you enough phrases to keep you travelling safely and get more from your holiday. A screenshot from our Lao language guide application for iPhone & iPod touch. Available for free from the iTunes app store. Audio guide for any mp3 player or computer - FREE! Contains: 14 min language lesson. Application for iPhone & iPod Touch - FREE! World Nomads Language Guide Podcasts are free to download and may be used as free content on other websites so long as no part of the podcast is changed, altered or added to in any way. World Nomads Language Guide Podcasts may not be sold by any website or individual. © WorldNomads.com Pty Ltd, 2006-2011.